Meeting customer demands and on-time delivery are the top most priorities for logistics managers. We developed an automated vehicle inspection mobile app to streamline inspection process and deliver faster services to customers. Automating the delivery inspection process and making it paper-free would not only make the process more effective and quicker but also convenient for customers. The vehicle inspection app was built using Xamarin cross platform technology. Automotive transportation and logistics management organizations often face issues in delivering vehicles to their customers in mint condition. A survey conducted with 60+ international supply chain executives from the logistics and manufacturing industry found that “meeting customer expectations” followed by “on-time delivery” were the top priorities for logistics managers. This clearly highlights that logistics customers demand flexibility and visibility for car delivery. To address the demand, car inspection processes are setup to offer defect-free delivery. At present, the inspection process in the car industry is carried out manually using paper based inspection. Due to this, the process is time consuming and vulnerable to the possibility of human errors. The inspection process once completed needs to be manually entered into the back-end ERP system for analysis. Our client wanted to automate the inspection process and shorten the delivery cycle time to match the customer expectations. 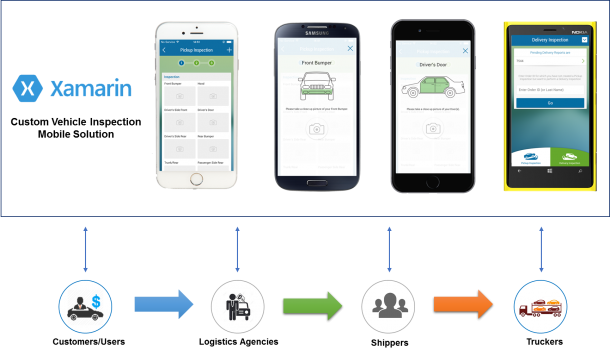 Rishabh Software as an experienced Xamarin mobile development company delivered a win-win strategy by developing a custom pre-delivery vehicle inspection mobile application to streamline the delivery inspection process. The solution was paper-less and proved to be more efficient in capturing and analyzing inspection data. The development focus was emphasized on automating the inspection process. The mobile solution was built using multi platform mobile application development to address multi-device accessibility & usability. Additional features like capturing images as per the body parts of vehicle, and report generation were incorporated to deliver hassle free service to customers. The solution was built in a planned phase manner, starting with a “Proof of Concept” to test and validate market acceptance of the proposed concept to developing the final mobile ready solution. US based logistics & supply chain organization delivering vehicles and conducting various pre & post-delivery vehicle inspection checks.